This Badam Kheer /Almond Kheer is inspired by the traditional Kheer which is an Indian rice pudding. Instead of rice, I have used coarsely ground almonds in this badam kheer recipe. On most festive and special occasions in India, Kheer finds a place in the menu. Be it a birthday or an occasion like Raksha Bandhan. There are many version of Kheer - the one with rice being the most common and popular. You can also check out my Carrot and Almond Kheer recipe here. Sadly, I do not get to make kheer often at home as DH doesn't like it much. But, whenever I make it for myself, I make 2-3 servings and enjoy a bowl of kheer with every meal. I like my kheer to be creamy with cardamom and saffron, and there should be lots of dried nuts in it. 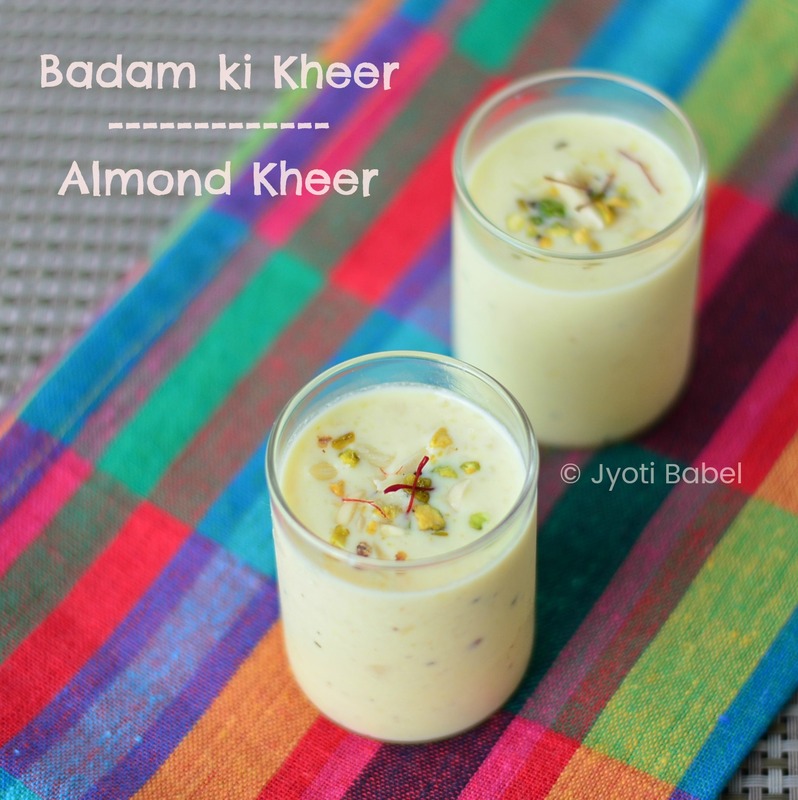 So, when I chose 'Festival/ Special Day' theme for week 4 of BM#78, I decided to make badam/almond kheer. With Raksha Bandhan around the corner, I think the recipe fitted the bill perfectly. This Badam Kheer is actually quite rich and should be served in small portion size. 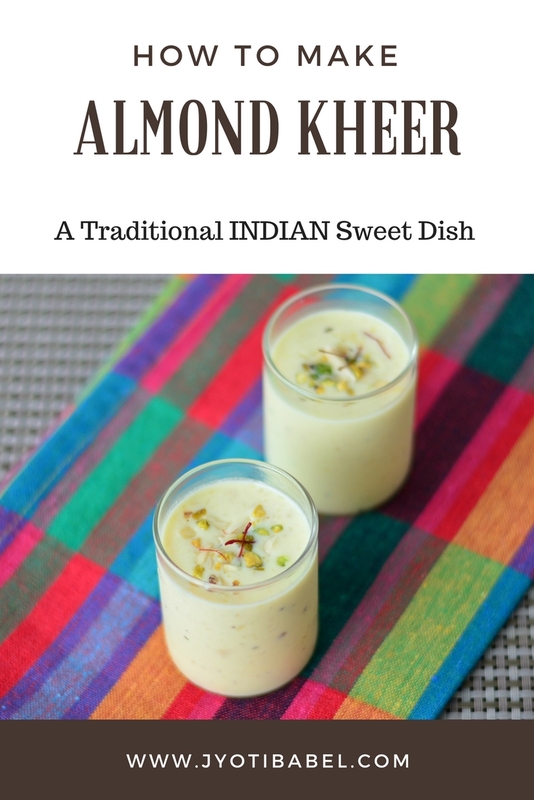 Let's check out how I made Badam Kheer/ Almond Kheer from scratch. 1. Soak almonds in water for an hour. Drain the water after an hour and soak them in hot water for 5 minutes. Peel off the skin from the almonds and grind them into a rough paste. 2. Boil milk in a deep non-stick pan. Let it simmer on low to medium flame for about 15 minutes, such that the milk reduces to about 3/4th volume. 3. Add the almond paste and boil the milk for another 7-10 minutes. Depending on how thick and creamy you like the kheer, you can boil it for another 10 minutes or so. 4. Add the condensed milk and sugar and stir well. Add cardamom and saffron milk. Stir again and take it off heat. 5. Let it cool down and then you can transfer it to a serving bowl and keep in the fridge to chill. 6. Serve it chilled with almonds and pistachio garnishing. 1. If you do not have condensed milk, you can skip it and add more sugar for sweetness. I had some leftover condensed milk so I used it in the recipe. 2. This kheer takes best when served chilled. Good idea to make this yummy rich kheer for Raksha Bandhan or for any occasion. I love to put lots of almonds in my kheer, but never made almond kheer. This rakhi I'm gonna try it for sure, as I'm not in a mood to make too many sweets. I am yet to make badam kheer . Looks so creamy ad delicious. I am very fond of badam kheer but don't make it often. Your post just reminded me of how much I like it. This is one is our favorite kheer, gets ready in a jiffy and we all love to relish it cold! Love your clicks jyothi, simple , clean and crisp!